What was also clear was that Catanzaro’s knowledge about radical social movements was negligible. His ideas were seemingly entirely based on interviews with three American academics. He had not bothered to consult EarthFirst! activists nor the Luddites group (who have open meetings almost every month) despite focusing on these groups for a good part of the article. Instead, for Catanzaro, radical environmental activists can all be lumped together in one mass of people who are ‘anarcho-primitivists’ and responsible for these terrorists attacks. This is both ridiculous and harmful. I would have expected The Guardian to require evidence from their journalists before they publicly accuse a group of terrorism. Catanzaro’s detective work led him to a reference in a 80s EarthFirst! journal about Ned Ludd, of the Luddites, an early 19th century movement that was famously critical of some new technologies (those that are harmful to commonality). This link in the 80s journal is the only piece of evidence offered. Regardless, The Guardian has used the EarthFirst! 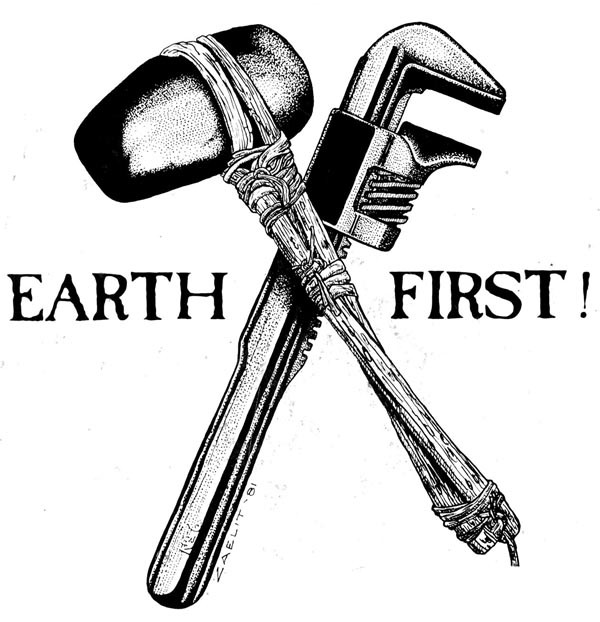 logo as the leading image for the article, implying that EarthFirst! was involved with the string of attacks. Again, two groups ‘Tending Towards Savagery’ (ITS) and ‘Olga Cell of the Informal Anarchist Federation International Revolutionary Front’ have claimed responsibility. I wrote The Guardian editors earlier this week to request that they remove the EarthFirst! logo since the group is being unfairly accused of terrorism. What is especially disappointing about this episode is the polarisations and lack of understanding that are a result of this type of hot-headed journalism. Those whose concern is to stop terrorism would be wise not to run around calling groups with whom they disagree with ‘terrorists’. This kind of moral panic adds fuel to the fire. This is not the way to build trust in new technologies. If Michele Catanzaro was serious about responding to terrorism at nanotechnology labs he could have written an article that responds to the radical environmental critique of nanotechnology (please see: here, here, here, here and here). There are important concerns that deserve public scrutiny. Instead we are offered an unsubstantiated rant based on groups about which he has very little understanding. The Guardian has now made a very harmful accusation. The paper allowed a group to be linked to specific terrorist attacks – with no actual connection. A little historical context will demonstrate the harm done by this article. Amongst many EarthFirst! ‘accomplishments’ The Camp for Climate Action originated from the EarthFirst! movement in 2006. We know now that many of these activists (also former Climate Campers) were targeted by people like Mark Kennedy, working as spies for the state. This is justified by the idea that they are terrorists. I am sad to see The Guardian supporting this vilification of the UK protest movement. Scientists such as Michele Catanzaro are foolish to write about social movements and radical theory knowing so little about the ideas and actions of the various groups. Instead of informing the public on dangers and helping create greater understanding of the issues, this kind of journalism obscures what has actually happened and the relative dangers involved with what is going on.